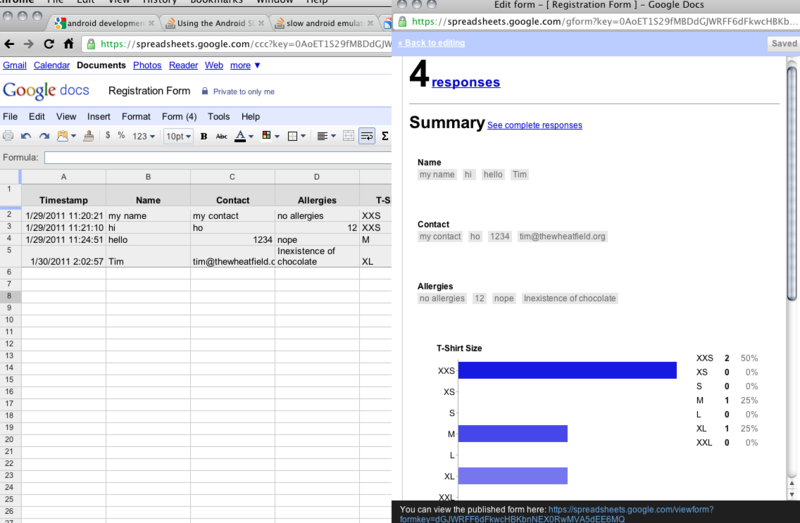 Last Saturday a friend asked if it would be possible to have an online registration form for a camp their organizing, so I thought it would be a perfect time to look at Google Docs as I remembered that they had a form creation functionality and I was pleasantly surprised and what I discovered. 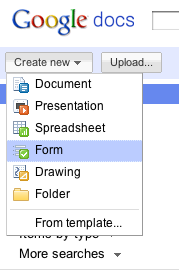 What is great is that Google Docs provides a relatively simple way to create the form and share it online (remember to change the privacy settings to public/not require a sign in if you want the public to answer). 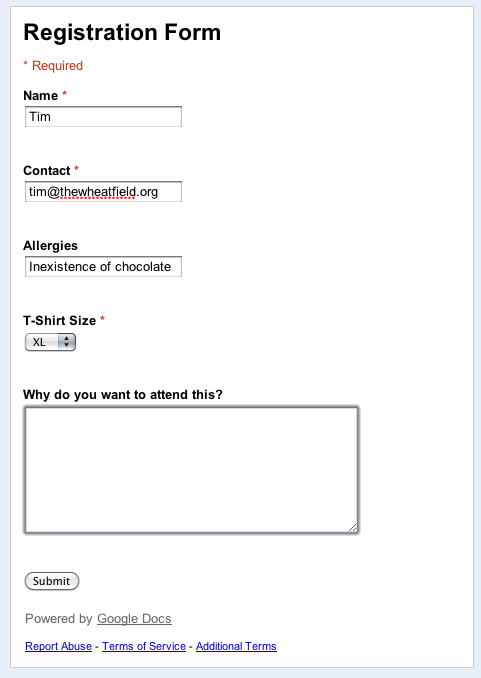 Above is a simple form that I came up with in about 5 minutes of playing around with the Form builder: just select the field type from a drop down list (text / multiple choice / checkbox / etc) and enter the question details and mark the field as required if necessary. Drag and drop the fields to arrange their order. Plain and simple yet effective. Now aside from that, you can also choose a theme from their presets although I don’t think you can make any changes/customizations to the theme, but nonetheless a nice option as opposed to a standard white background form. 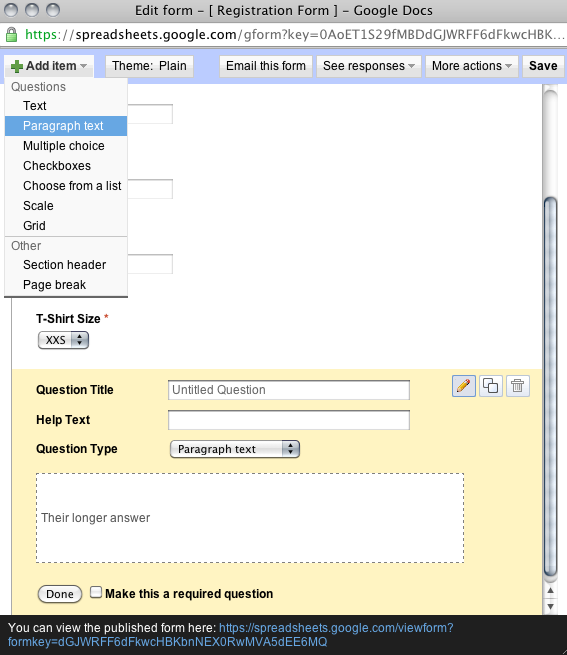 Not only does it generate the form, but all the responses are automatically linked to a spreadsheet and charts are even drawn up based on the the answers to the questions. So if you need a quick registration form / questionnaire all it takes is 10 minutes of your time to generate a simple form and be able to share it with anyone. Check out Google proxy page. This is based on the findings of Mark Wieczorek here: This is catered to mobile devices and PDAs so it paginates the web page and gives you an option to hide images. But helps strip out unneeded information and page “spam” as show in the before and after links. Show Me Where It’s At! Ever had a person ask you if you know where a certain place is and you couldn’t get a good map to show them? Well I ran into this issue and I wanted a quick way to add a marker to the map and pass that information on to the necessary person. So here I introduce….